Between 1993 and 2002, the Republic of the Congo was affected by numerous conflicts which destroyed the country. Congo is attempting to rebuild itself, and even though some improvements can be seen, the children’s rights situation remains very fragile and worrisome. In particular, all types of discrimination have been inflicted on too many children. Despite an improvement in the Congo’s economic situation in 2010-2011, half of its population still lives below the poverty line and only has poor access to health and social services. Children in rural areas do not benefit from the same advantages as those in urban areas due to unequal access to services. For example, in urban areas 84% of the population has access to drinking water compared to 27% in rural areas. Health care is a sector that is a source of worry for the Congolese government. In fact access to health care constitutes a major problem for the majority of the population. Medicine and specialty care mainly come from abroad. Despite an improvement in facilities, there aren’t enough personnel and quality health care is too expensive. It is therefore very difficult for the population to gain access to health care. Moreover, personnel and health facilities are not equally distributed within the country. In fact, Brazzaville, the capital of the country, has more than 66% of the doctors, 42% of the paramedical staff and 28% of the hospital beds. It is therefore very difficult for those living in the countryside to access health facilities. In the Republic of the Congo, school is compulsory from age 6 to 16. Along with health care, education is one of the sectors that the Congolese government has identified as a priority. However, despite its efforts, the results are not yet satisfactory. Even though the Republic of the Congo has an especially high enrollment rate (80% of Congolese children are schooled) and is part of the highest performing African countries in this field, it is very difficult to ensure that its population will receive a good level of education. Public education is not quality education since the Congolese public schools are under resourced and there are large disparities between the cities and the countryside. 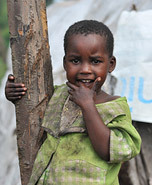 Most of the refugee children in Congo are of Rwandan origin and fled their country due to conflicts. These children don’t have access to education or health care. They are pushed into forced labor in order to survive and are subjected to violence. The United Nations High Commissioner for Refugees (UNHCR) works closely with authorities in order to improve their situation. It is now possible for more and more refugee children to attend regular Congolese schools. This shows the willingness of Congo to respect the rights of refugees. There are other problems, however, which need to be corrected, particularly related to the attribution of Congolese nationality. In the Republic of the Congo, indigenous people, still pejoratively called “pygmies,” represent 10% of the total population. They are subjected to injustices and systematic discrimination. They live in harmony with nature and are often considered “wild.” For the most part, they don’t have access to education or health care. According to UNICEF, 65% of pygmy children between the ages of 12 and 15 do not go to school, compared to 39% at the national level. This is explained by the fact that their parents often have trouble obtaining their birth certificates which are needed for school enrollment, since the birth registration centers are often far from their homes. Even if they are able to get there, they are often not granted the certificates, which is in violation of their children’s right to identity. Indigenous children and their families are subjected to slavery, forced work and are often the target of physical and sexual abuse. At school, indigenous children are often thrown out of class or parents of non-indigenous children decide to take their children out of class so that they don’t associate with indigenous children. An action plan to improve this group’s quality of life was established in 2009. The government hopes that in 2013, 50% of indigenous children will receive high quality school education, 60% will have access to HIV/AIDS prevention and care services, and that 90% will be registered with the state. In Congo, child labor is prohibited by law. One must be 16 years old in order to work. However, in practice and especially in rural areas, many children work with their families on farms or in small businesses. In the markets, it is not unusual to find children working long hours in difficult conditions and for almost nothing in return. The Congolese government hasn’t published a report on these practices. However, following a survey done in 2005, the International Labor Organization estimated that 85% of children in rural areas work in exchange for low wages. 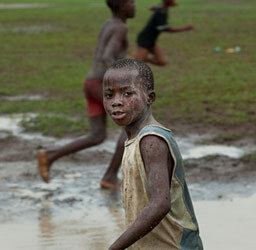 In the Republic of the Congo, many children live on the streets. They are mostly found in Brazzaville and Pointe, the country’s two main cities. These children, who have no protection, are very vulnerable. They are often the victims of sexual exploitation or fall into the hands of drug dealers. In order to survive, these children beg or sell what they have stolen. This is mainly due to impoverishment of families, divorces, abusive situations as well as crises and armed conflicts. In order to deal with this problem, a Center for the Integration and Rehabilitation of Vulnerable Children (CIREV) was created in 2003. This center is part of 5 orphanages financed by the United Nations High Commissioner for Refugees and whose goal is to establish housing, food, education and protection for children. Actions undertaken by the government are monitored by teams of social workers, educators and psychologists who are responsible for monitoring children at all stages of integration and rehabilitation. Between 7 and 10% of the Congolese population lives with a disability and in 66.3% of those cases, these disabilities have been present since birth. Children with disabilities suffer from social exclusion. Without access to school and unable to work, they find themselves on the street and beg to survive. However, Article 30 in the Congolese constitution grants special protection for disabled people. Initiatives have been taken by the government to improve the care for these people, but the results are not yet satisfactory. 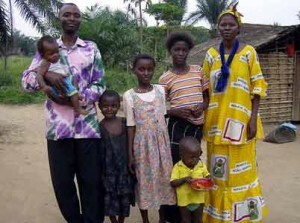 In Congo, 7.9% of children between the ages of 0 to 14 live with HIV/AIDS. According to the Committee on the Rights of the Child, the Congolese tend to discriminate against people affected by HIV/AIDS and particularly against women and children. Children who are HIV positive therefore have trouble fitting in. They are rejected by society as a whole, whether it is within their families, their communities and even in certain health centers. This problem is difficult to solve since people affected by the virus, children and adults, often refuse to take their medication in order to go unnoticed within society. The government is trying to protect the rights of HIV positive people so that they are not condemned to social exclusion.